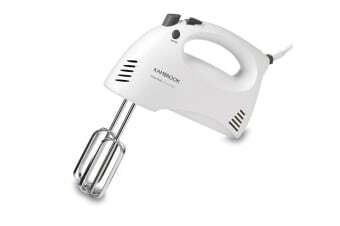 Powerful 205W beater for easy mixing. The chrome plated beaters and adjustable power controls will help you create everything from fluffy meringues to perfect cake batter. Easy to maneuver and simple to clean, the Kambrook Essentials Power Mix Hand Mixer eliminates laborious hand whisking and lumpy batter for perfectly smooth mixing results every time.